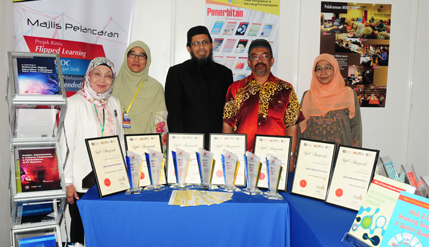 SHAH ALAM, 14 November 2014 – The National University of Malaysia (UKM) swept seven of the 12 Awards given out at the National Universities Carnival of E-Learning (NUCel) 2014. UKM’s Centre of Teaching and Learning Technology led by Professor Dr Mohamed Amin Embi was awarded the best managed E-Learning centre at a ceremony here today. Prof Mohd Amin personally won prizes in three other categories; Higher Institution E-Learning laureate, Best E-Learning facilitator and Creative and Interactive E-Learning Content (Mobile apps). The other winners from UKM were Prof Madya Dr Melor Md Yunos for Creative E-Learning Methods (Blended Learning, Flipped Learning and Project-Backed Learning), Dr Ahmad Zamri for Creative and Interactive E-Learning (General) and Prof Madya Dr Rosseni Din for best E-Learning Blog/Wiki. Best managed Learning System, Universiti Teknologi MARA (UiTM). Creative and Interactive E-Learning Content (Video), Dr Zaleha Abdullah from Universiti Teknologi Malaysia (UTM). Best Massive Open Online Course (MOOC), Taylor’s University. Best Open Councel Ware, Chong Yee Ling and Badiozaman Sulaiman from Universiti Malaysia Sarawak (UNIMAS). There was no winner for the category of Best E-Learning System (Self-help) this year. The NUCel 2014 carnival which was jointly sponsored by the Education Ministry, The Public Universities E-Learning Council and UiTM was aimed at providing a platform to promote E-Learning applications and Blended Learning. Those taking part were Malaysian citizens from the country’s public and private institutions of learning.